The Banshee from Gundam Unicorn takes the form of a model kit! This Gundam UC Unicorn Gundam 02 Banshee Ver. 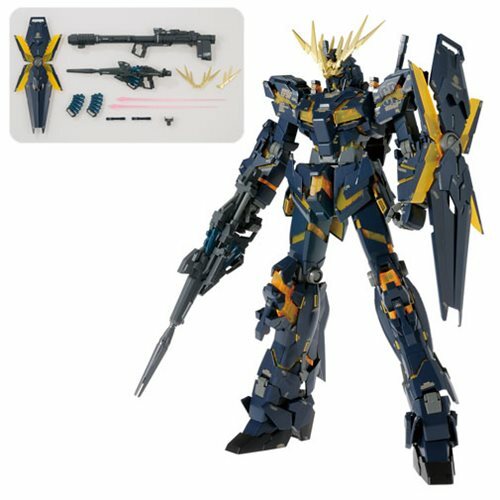 Ka MG 1:100 Scale Model Kit replicates the appearance in the novel before being adapted into an animated work where it was a black and gold colored Gundam Unicorn with a different head crest. The model kit can transform between Unicorn and NT-D Modes. The kit includes Beam Magnum, 4x Beam Sabers, transforming shield, bazooka, gold colored water slide decals, 22x runner, foil sticker, water decal, and instruction manual. Measures about 8-inches tall.